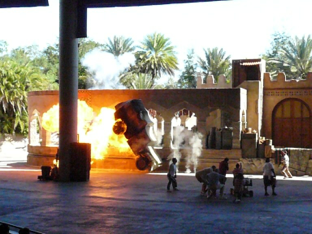 It was "watch things be set on fire and explode" day today at Hollywood Studios, where we saw some amazing stunt shows and ate a giant turkey leg. By far the highlight was the Indiana Jones attraction, which recreated three scenes from Raiders with life actors, real sets and real stunts. It was absolutely fantastic to watch and so much fun. Definitely one to see when you come to this park. 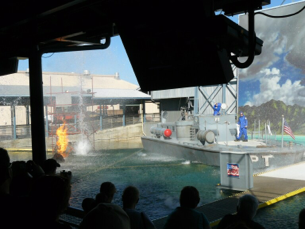 We also took in the Backlot Tour, which true to form, set things on fire and made things explode, so it also was a hit. 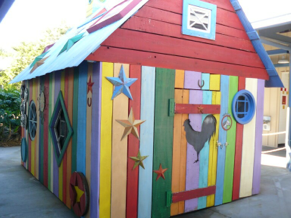 The Backlot Tour also featured a lot of movie props, including this one from the Hanna Montana movie. And while it was not set on fire nor did it explode, I figured my kids would get a kick out of it. 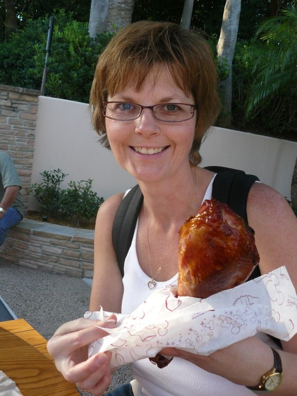 Other highlights included Star Tours (which we did 3 times today and once on Sunday) and GIANT TURKEY LEGS! So, yeah. a wonderful day was had.